Jennifer Ardolino is a graduate of Colorado’s Institute of Art. A Native of South Florida, Jennifer has gained national and international commendation, earning her several awards on the circuit of art show. Jennifer’s artwork can be found in Galleries in Caribbean hotels, throughout Florida, as well as in private and corporations collections including: Paradise Island, St. Croix, Nassau , Sandal’s Resort, Hyatt, Doral Resort, Miami Lakes, and many others. Jennifer publishes her artwork by herself. Her several years experience in graphic design has given her the skills and expertise she needs for this and to produce her own Giclee prints. She has therefore enjoyed the absolute control of the quality and artistic content of her work. 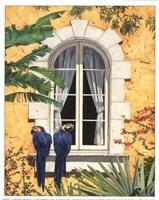 Her Giclee prints and paintings are a true blend of color, nature, art and state of the art technology. Jennifer’s art can be found in collections such as Doral Resort, Miami Beach, Doral Resort, Miami, Hyatt, Miami Lakes, Paradise Island, Nassau, and Sandal's Resort, St. Croix. She has a magical way of transforming what she sees into wonderfully colored images that are vivid and that transport the viewer into the scenes. Jennifer sees art in many things and her paintings have always reflected her surroundings. Jennifer’s chosen media include the strong vivid colors of acrylics, and the sinuous beauty of watercolors that’s natural. Jennifer’s paintings range from the manicured and beautifully colored tropical landscapes of South Florida, to the wild untouched natural beauty of a remote island in Caribbean where she has sailed and visited many times.